This is the enhanced version from the previous 5 Element Pagoda amulet. While the normal 5 Element pagoda is taken directly from the Tibetan Buddhism style pagoda without considering the proper sequence of the element, this corrected version appropriately magnifies the metal energy. Starting from the bottom the five types of shapes representing the five elements have the following sequence: water to produce wood, wood to produce fire, fire to produce earth and finally earth to produce gold. There is a powerful mantra tediously scripted onto the amulet giving even more superior protection. 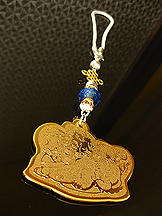 Behind the amulet is the protective Kwan Kung holding the "Kwan Dao" to terminate evil forces and draw good fortune. Meanwhile the mystic knots ensure a smooth ride. This amulet is required by those suffering from the wrath of the deadly 5-Yellow. When the magnitude of influence from Violent Star #7 becomes overly amplified, you need a substantial amount of power to counter such undesirable energy. Scars can be permanently left both physically and mentally when violence and injuries happen. In order to prevent such unwanted events from happening to yourself and loved ones, carrying this powerful safety amulet is the best remedy. This amulet has the powerful trio, namely the rhinoceros, the elephant and the fu dog to triumph over the violence energy. The Fu Dog provides more power and divine help to the rhinoceros and elephant in countering the evil energies from the hidden realm of Violent Star #7. This is necessary when the #7 becomes too powerful. There is a design of water wave in blue to simulate and amplify water energy. Besides, there is also a "Kan Trigram" inscribed on it. It is derived from the I-Ching Magic (ancient Book of Changes). It holds the key in combating the metal element energy of violence from Star #7. Old style feng shui masters will understand this better. Last but not least, there is a protective taoist incantation which provides powerful protection against bodily harm, injury, negative people, robbery and violence. This amulet is energy infused and emits energy unendingly. This wealth optimizing amulet promises long term prosperity with sufficient solid savings attained. 1.It has nine phoenixes to magnify your wealth creating opportunities by nine times. The nine phoenixes also bring fame, good reputation and happy news. 2. It has the "Tibetan Eight Bringers of Good Fortune" which is the sign of perfection in benefits. 3. It is designed in the shape of a wealth vase with a Wishfulfilling Jewel of Royal Power on top to magnify your wealth luck. This amulet will maximize your wealth luck through the tapping of long term prosperity energies blessed by Prosperity Star #9. One will attain strong recognition, win important contracts, gather new opportunities and secure future savings by carrying this amulet. The powerful eight auspicious symbols used either individually or together for feng shui practice is derived from the Buddhist pantheon. This all-in-one product is a wood carving that displays all the eight auspicious objects together which would bring complete good fortune, material luck, spiritual growth, peace, confidence and genuine happiness. The mystic knot magnifies fortune for Period 8, the conch provides good networking luck, the canopy counter against bad energy, the vase is for abundance, the wheel represents success and improvement, the double fishes represents wealth and money, the lotus for peace and the victory banner symbolizes accumulation of successes. Eight auspicious object is also an important antidote for killing energy, especially for cases where doors are all aligned in one straight line, maindoor opens to a garage, the staircase is facing or too close to the maindoor, the doors are aligned facing each other in a straight line and bad external forces pointing to a specific area of the house. Displaying the Eight Auspicious Objects hanging would also counter malevolent energies of the month either caused by flying stars or one's personal horoscope. One may also carry this amulet by hanging along handbags or hanging in the car for protection against bad luck and evil forces. 1. Travel to a foreign place for work. 3. Move to another state. 4. Migrate to a foreign country. 5. Move to another job. It is strung with jade pig, 6 amethyst beads and 3 Emperor coins. One should carry along it at all times, display it near them regularly or display it in the northwest portion of the house (324-336 degrees). Material: Natural jade, amethyst, jasper, hematite and bronze. It is strung with jade tiger, 6 amethyst beads and 3 Emperor coins. One should carry along it at all times, display it near them regularly or display it in the northeast portion of the house (54-66 degrees).